Home / Posts Tagged "valentines cookies"
Are you looking for something sweet to give your loved one this Valentine’s Day? We have the best cookie bouquets, cupcakes and chocolate dipped strawberries found in Houston and Cypress, TX! We are now taking pre-orders for Valentine’s Day! Gourmet Cookie Bouquets in deluxe containers that can be used again and again! 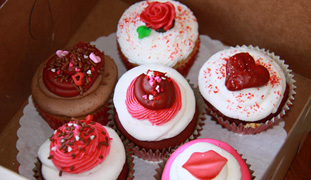 Also available 1 dozen cupcakes in the following delectable flavors: Red Velvet, Chocolate, French Vanilla all topped with festive Valentine toppers. If fruit is your fancy, we’ve got you covered! We’ve got large delicious strawberries dipped in rich dark and/or white chocolate, sold by the dozen. Both the cupcakes and the strawberries are boxed and bowed, ready for gifting to your loved ones! We are taking orders through February 12th with pick-up at our Cypress location the evening of February 13th or from 10am-7pm on Valentine’s Day.